So I posted last about how my whole operating system had an overhaul with my new job. I also said how I was going back to my soul mate program in Hammer and Chisel to try and "chisel" away the extra 20 pounds I put on over the last crazy year. I finished H&C but had little to show for it in the way of pounds lost, unfortunately. I did gain crazy amounts of strength (I used 50s and above for back and a few upper body moves in addition to lower body work! ), and I did shred a bit in my upper body. But the scale numbers - which, granted are not what I am usually concerned with - didn't move. And given my current weight, I AM concerned with them. I decided that I needed something different. It's pretty safe to say that I need a bit more cardio in my life. I hate cardio - with the exception of running and biking - but it's obviously something I need. So, I'm biting the bullet. Now, I'm not totally off my rocker - I'm still going to have weights (HEAVY weights) in my life. I have to stay sane, you know! Just so happens, we have a new program on the books that combines BOTH heavy lifting and HIIT training. AND, it was created by one of my favorite trainers from Les Mills Pump (remember that? ): Joel Freeman. So, starting today, I'm embarking on the journey that is LIIFT4! 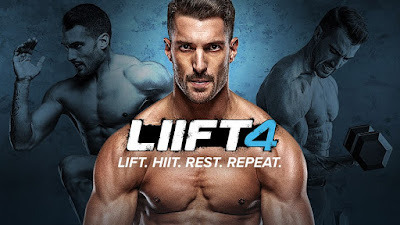 LIIFT4 is an efficient, no-nonsense 8-week program that combines weightlifting and calorie-burning High Intensity Interval Training (HIIT) with the nutrition needed for a complete body transformation. The moves are based on classic lifting techniques that encourage isolation, stabilization, and focus for the working muscle group. The schedule is just 4 days a week, with 3 strategically chosen recovery days. Every workout is 30–40 minutes. There are no gimmicky moves, no overly complicated routines, and no opportunity for boredom because each workout is filmed in real time; no workout is the same! Who would most benefit from LIIFT4? FYI - I will be posting my weekly thoughts on LIIFT4 here since it's a new program. I'd also love to work through this program with a few other people. Interested? Fill out the form below, and let's get to work!